Between youth football, high school football, college football, and professional football, millions of Americans take the field every year to sport their teams’ colors. Football is America’s game, but is also a physically demanding, high-impact, collision sport that can take a toll on the body. No matter what level you’re playing at, it’s important to make sure you take care of your body and address any injuries that arise as soon as they happen to prevent problems later on in life. Any bone can be broken when playing football- from small bones like fingers and toes to large bones like legs and even spines. Broken bones should be splinted immediately by a trainer if possible and x-rays should be done to determine the location and type of break so that they can be properly set. Commonly referred to as a "Stinger" or "Burner." A stinger is an incredibly painful nerve injury that results when the nerves in the neck are stretched, causing nerves in the shoulder to pinch or bruise. The result is a sharp pain (like that of an electric shock or lightning strike) and arm numbness and weakness. Effects are usually temporary and subside quickly. If effects linger consult a doctor. 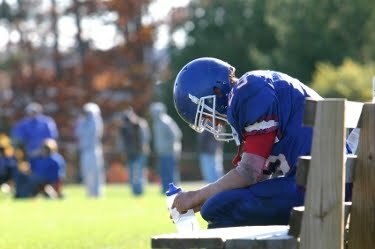 Concussions are graded 1-3 based on severity and can vary greatly in terms of recovery time. If a player is suspected to have a concussion they need to be evaluated by a medical professional immediately. Certain tests may be run to determine if a player has a concussion and a doctor may order that a player wait days, weeks, or even months before returning to the field. An upward and backward wrenching of the shoulder can cause a shoulder dislocation. Once a shoulder is dislocated from the socket it should be popped back in right away to avoid unnecessary pain and additional injury to the area. Depending on the situation x-rays may be needed to determine if any damage has been done to the area. Commonly referred to as a "Separated Shoulder". Many people believe a dislocated shoulder and separated shoulder are the same thing, but they are actually different injuries. A separated shoulder is often the result of a fall, and involves a tear of the ligaments between the clavicle (collar bone) and acromion bone (the highest point of the shoulder blade). The result is that the clavicle will actually stick up. Depending on the severity of the injury cold packs and a shoulder immobilization brace may lessen the pain and allow the shoulder to heal. In other cases surgery may be needed. Back sprains can come in all shapes and sizes but with ice and the right lumbar back brace back sprains can usually be corrected. It’s always a good idea though to consult a physician, sports therapist, or chiropractor to make sure that they injury isn’t severe, requiring more extensive treatment. Commonly referred to as a "Slipped Disc" or "Ruptured Disc." Small spongy discs cushion the vertebrate in your back and act as shock absorbers while you engage in activities like running and tackling. When a disc is overly strained it can bulge or rupture, causing the disc to become herniated. To avoid serious back injuries later in life it’s important to consult a doctor to determine the best course of action. Contusions to quadriceps can result from impact to the front of the thigh from something like a helmet. Compression and ice are important in the recovery process with quadriceps contusions, and often early motion can also aid in preventing stiffness from developing. Commonly referred to as a "Hamstring Pull". Hamstring pulls are actually a tear in the hamstring muscle fibers and can result from sudden acceleration or a blow to the body. Hamstring pulls can vary greatly in severity but often plague sufferers with repeat problems throughout an athletic career. Ice, compression therapy and rest are important to properly heal a hamstring pull. Commonly referred to as a "Hip Pointer." An iliac crest contusion is a bruise or a fracture to the iliac crest region of the hip that is treated with ice and padding. Ankle sprains are the most common sport injury and result when damage is done to the soft tissue and ligaments surrounding the ankle because of excessive twisting. The "RICE" method (rest, ice, compression, and elevation) are used to reduce swelling after an ankle sprain. Ankle braces and wraps can help speed up recovery as well. Commonly referred to as a "High Ankle Sprain." A high ankle sprain is caused when the leg and foot twist outward and can be much more serious than a regular ankle sprain. In addition to using rest, ice, compression, and elevation to treat a high ankle sprain, a hinged ankle brace or cast may be necessary in more severe cases. Turf toe is an injury to the base of the big toe from running or jumping on hard surfaces. This makes basketball players and football players on artificial turf more likely to sustain this kind of injury. ACL, MCL and PCL injuries most frequently result when landing from a jump or changing directions suddenly. When the ACL, MCL or PCL tears often a “pop” will be heard and the knee will give out. These type of injuries are incredibly painful and require highly specialized hinged knee braces, extensive physical therapy, and surgery to recover. Amongst athletes these are some of the most feared injuries due to the long recovery times associated with them. The meniscus is two pieces of cartilage that cushion and support the knee joint. Meniscus tears often accompany ACL and MCL injuries and are very easy to reinjure if not given the proper time to heal fully. Ice, compression, elevation, and physical therapy are essential in healing properly after a meniscus tear. Surgery may even be required depending on the individual circumstance. About MMAR Medical Group: MMAR Medical Group Inc. is a supplier of medical products including a wide selection of medical grade braces and cold therapy products. To find a quality medical knee braces and supports, please visit MMAR Medical online.